This is Microhyla pulchra, otherwise known as the beautiful pygmy frog. It seems to be doing okay in the wild—it may even be an invasive species—but that’s tough to confirm because of its unique biological ability: crypsis. First, some from facts: It lives in southeast Asia. Although the frog is small and it lives in habitat that is fast turning urban or agricultural, it seems to be doing pretty well for itself. 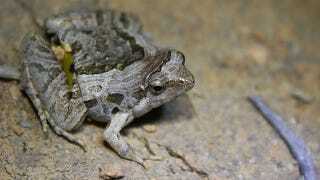 The beautiful pygmy frog lives around the edges of a forest, and reproduces in temporary freshwater ponds. This means it’s right at home in areas where forest is turning into farm land, and where people dig ditches or leave depressions that can, temporarily fill up with water. Scientists are concerned because a population of these frogs seems to have been introduced into Guam. That’s outside of its original range. It’s possible that the pretty little frogs got brought to Guam as pets, or that they were brought over as food. (Some people do raise and eat them, although they can’t have much meat on them. The frogs usually don’t get bigger than a couple of inches.) It’s tough to say whether they’ve taken hold there because apparently these frogs have a property called crypsis. Crypsis is an entity’s ability to avoid detection. It can be a predator’s ability to avoid being spotted by prey, or prey’s ability to avoid being spotted by predators, or, in this case, an animal’s ability to avoid being spotted by biologists. Although I know it’s a valid term for a behavior, I can’t help but admire the ability of biologists to make their own failure to find an animal into a recognized property of the animal. “We can’t find it! It’s not our fault! It’s just... these animals are known to be cryptic.” Nice try, people.